At first blush, it seems like kids should practice taking tests all year round. Read and test. Read and test. If they read and test frequently, they will get better at taking tests. Right? The best ballet dancers and football players practice, practice, practice. Practice, in fact, makes perfect - or so they say. But, is it just the practice that makes the performer great? I took piano lessons and, yes, I remember practicing scales. If I look at the whole of my instruction though, there was much more to it. I watched my teacher model, conferred with her once a week, and had some choice in what I wanted to play. In a second class per week, I deconstructed music with 2 students at the same ability level to discover how to put it back together logically. My teacher also made me compose my own music with poems as the lyrics. I listened to recordings of the masters so I could envision how the best musicians played. All of this instruction prepared me for a purpose - performing at recitals and enjoying playing the piano. I want students to love reading, and I’m fully aware they’re required to pass tests. What should I provide so that they will achieve both? Well, tests assess students’ ability to think. To put it another way, students do not need to know content to pass a reading test. They have to be able to read. If a reader knows how to find and interpret information on the page, he/she will pass the test. Furthermore, there is no research to prove that taking practice tests – especially without feedback besides a grade – will help students prepare. From experience, I do know that when my students solved big puzzles like writing novels, performing plays and searching for critters in pond water, they scored well. From this starting point, I begin my research on what works when preparing students to take tests. Do we know "test prep" works? Do we have data to support this instructional decision? When I finished reading Calkins' book, my colleagues and I launched into our own study. We designed test-taking genre units. Our lessons were sprinkled throughout the year: demonstrating test-taking strategies, conferring with students about what worked, adding a test-type question along with other daily formative assessments, talking about how we chose our answers, asking students to reword question stems to see if they even knew what the question required them to do, and building stamina in extra long silent reading sessions every other week. In addition, at the end of each healthy, in-depth study of every genre, we added a few “test-genre” lessons. For example, after studying poetry for 3 weeks, we spent another couple days explaining how the genre would be tested. We explored the vocabulary we would see on a test about poetry. We examined the kinds of questions test makers might ask. Read the questions before the passage. Overview the selection before diving into reading. Cover the answers, determine your answer, and then find the answer that matches what you think. Mark the questions that are confusing in order to take a second look at just those when checking tests. Think of tests as games and try to do the best they can instead of trying to get a perfect score. Reword the questions into every day language. 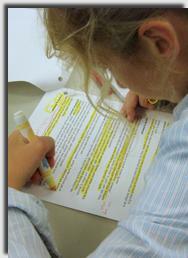 Move back and forth between the questions and the passage when answering text questions. Most of all, students should be relaxed and yet a bit on edge to perform their best. Don’t scare them by saying things like, test makers try to trick you. Better to tell them that the items are field-tested and that the answers are either directly in or a combination of clues in the reading. • Games to get you started. In my first lesson, You Gotta Teach This Lesson, I suggest you conduct research in your classroom by watching how your students take tests. Use this lesson to demonstrate why listening to and using the Test Secrets are so valuable. Have fun and make test practice a very small portion of your instruction that’s spread throughout the year. You can bet that now I watch my language carefully. I say, “Try to write an interesting beginning but if you can’t think of one, just go with the first thing that comes to mind.” Sometimes, even teachers learn the hard way. Students do listen to us, sometimes more than we think. I never say always anymore. Teach students how to answer multiple-choice questions all year rather than in marathons. Students need to practice sustained reading time in order to build stamina for taking long tests. Students gain confidence with mantras and songs. I provide a rap I wrote, but create your own. Also, other Internet addresses for raps on this document. Teach students how to prepare the selection as they read with this lesson. Teach students how to handle these challenging texts. It’s only fair that you teach your students the Test Secrets included in this handout. Shhhhh! Fiction passage for Who Wants To Be A Millionaire?